Whew! What a week! This weeks review session seemed like it was at least a month long! (life happens). On a positive note, we have more reviewers on staff here at YoYoSkills so you have N-Mart, Melford, Mr. J, and Francis to fill in when I get slammed with life, work, and lifework. I think it is safe at this point to just assume that Ernie at General-Yo knows what he is doing. This guy has consistently pumped out killer design after killer design, and has even experimented in the precious metals realm that is always hit or miss. His big wins make up a list of names that reads like a champion horse pedigree. To this day, I still consider the Torrent, Ernie’s introductory design to the General-Yo brand, to be one of the best yoyos I have ever thrown. One of the latest General-Yo designs landed on my porch. The KLR. Did I let this killer into my home? Yes, yes I did. Honestly, the gal of Ernie to send me a yo-yo that can’t cook me breakfast. I woke up the first night of the review session and rolled over to face my end table. The KLR was just siting there, not doing anything! I mean, here it is, Sunday morning at 7am and there is no eggs in a pan, not a whiff of bacon, and certainly no english muffin in the toaster. I mean, what did I do to offend you Ernie? You dare bring this… LEACH onto my home to oxidize in my air and absorb my wifi signals? But seriously this yo-yo is very well designed. It is kind of a throw back to the rim heavy yoyos that were popular a few years ago. These days, a popular design trick is to hide the weight about half way down the catch zone. With the KLR, Ernie has the weight start at the halfway point and carry inward towards the rim. The result is an open cup, rim focus, and a deep matador spike. The KLR is also very available to many different player styles. The model Ernie sent me is the Competition Grade KLR which has simple colors and a bead blast finish. Alternatively, you can get the KLR in brighter colorways, splashes, fades, and also choose between beadblast, shiny or raw polished. See that empty column up there? The one where I give constructive feedback on the playability of a yo-yo? Yeah, its empty. There is a reason for that. I threw everything I had at the KLR. Short of lighting it on fire and chanting team names of Green Bay Packers, the KLR performed exceptionally . Regens, horizontal play, grinds, long spin killing combo’s…. Seriously I was unable to find any folley. The KLR was especially positive on stability. There is a very narrow line between “tilty” and “Brick house” and the KLR has found it. It won’t tilt on you unless you want it to, and then only as far as you intend to tilt it. I don’t think that Ernie really knows the full scope his yoyos have on players. I have had this yo-yo from Ernie, a Completion Grade KLR a while ago, and for the last month I have been carrying the KLR trying to figure out if there was something I didn’t like. Something I could give constructive feedback on, or not show unabashed geekism over but I can’t. This yo-yo has one job: Play hard and precise. And dang it all if it doesn’t do just that. 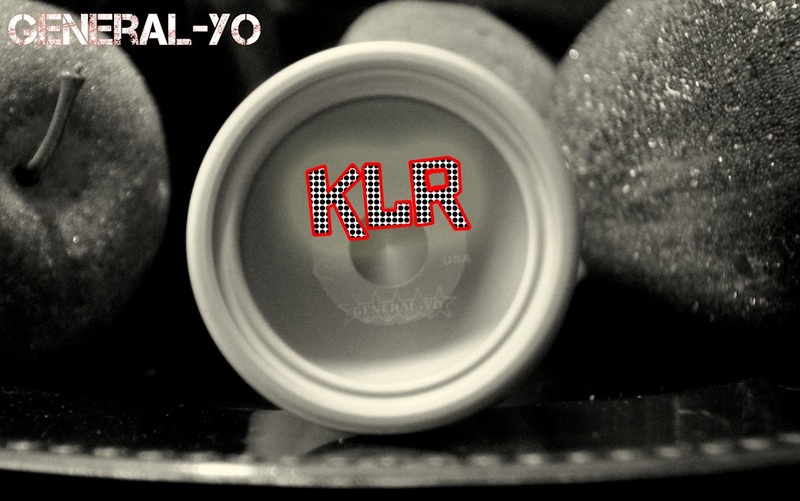 The KLR, if you can get it, is not only a must addition to any collection, but also a serious contender for completion level play where you need a yo-yo to be consistent and reliable.